It’s time to look beyond the hype and get real about the Internet of Things! In a second step we took the time to collect all published information about these IoT projects and put them into a structured list. There is a vast number of insights hidden in the data, some of which we would like to share with you today. Most of the IoT projects we identified are in industrial settings (141 projects), followed by Smart City (128) and Smart Energy IoT projects. The Americas make up most of those projects (44%), followed by Europe (34%). There are large differences when looking at individual IoT segments and regions. The Americas and particularly Northern America is strong in Connected Health (61%) and Smart Retail (52%), while the majority of Smart City projects are located in Europe (47%). The Asia / Pacific region is particularly strong in the area of Smart Energy projects (25%). Connected industry is the largest IoT segment in terms of number of IoT projects. This segment covers a wide range of connected “things” such as printing equipment, shop floor machinery, cranes or entire mines. One of the largest sub-industries is Oil & Gas. The ability to remotely monitor and optimize heavy assets has resulted in a number of projects. An example is RasGas´ LNG equipment monitoring in Ras Laffan, Qatar, allowing the LNG producer to perform predictive maintenance on its assets. Manufacturing shop floors are another area of major importance for IoT. For example, German food producer Seeberger knows exactly where specific goods are at any stage of the production process allowing for complete food traceability. 20% of all identified IoT projects are Smart City related. On top of that, the IoT Employment Statistics Tracker shows a strong upward trend on the back of hundreds of recent Smart City initiatives started by governments around the world. Prominent examples include the City of Barcelona and the City of London. The most popular Smart City application is Smart Traffic (e.g. Intel and Siemens´ Smart Parking solution in the City of Berlin) followed by Smart Utilities (e.g. Dublin´s smart bins). Other Smart City initiatives evolve around city safety. A notable (European) safety monitoring IoT project is the CityPulse IoT project in Eindhoven where the information on noise levels is matched with social media messages in order to detect and manage incidents and adjust the street lighting accordingly. Both North and South America appear to be strong adopters of Smart Energy projects with nearly half of all identified Smart Energy IoT projects taking place there. The majority of Smart Energy projects can be classified as Smart Grid initiatives, an example being the American City of Fort Collins Utilities´ Smart Grid initiative. Another extensive Smart Energy project is the smart grid demonstration project on Jeju Island, South Korea, which incorporates both distributed renewable generation and advanced meteringinfrastructure. While typically these projects focus on increasing the efficiency and reliability of the grid, IoT technology can also be used to avoid energy theft as showcased in a project in Tucumán, Argentina. Connected cars is one of the more mature IoT segments in which M2M/Cellular type of IoT connectivity has been employed for quite some time. Most Connected Car IoT Projects focus on vehicle diagnostics and monitoring. Two out of three projects can be classified as Fleet Management initiatives, an example being Telefonica´s fleet management solution for ISS. On top of that, there are a number of usage-based car insurance projects, e.g. Unipol Sai´s black box solution. Other types of projects include real time decision support for Honda´s racing team or Daimler´s Car2Go car sharing service. Despite the current LPWAN hype, less than 10% of all identified IoT projects employ this type of connectivity. 59% of all identified LPWAN projects are currently implemented as part of Smart City initiatives, for example Gorizont-Telecom´s Smart Parking solution in the City of Minsk. The main value driver for most IoT enterprise projects is cost savings. This number is particularly high in the Smart Energy segment in which 84% of IoT projects target cost reductions. The number is also relatively high for Smart Supply Chain projects (61%). An example is Kore Telematic´s cold chainmonitoring solution. 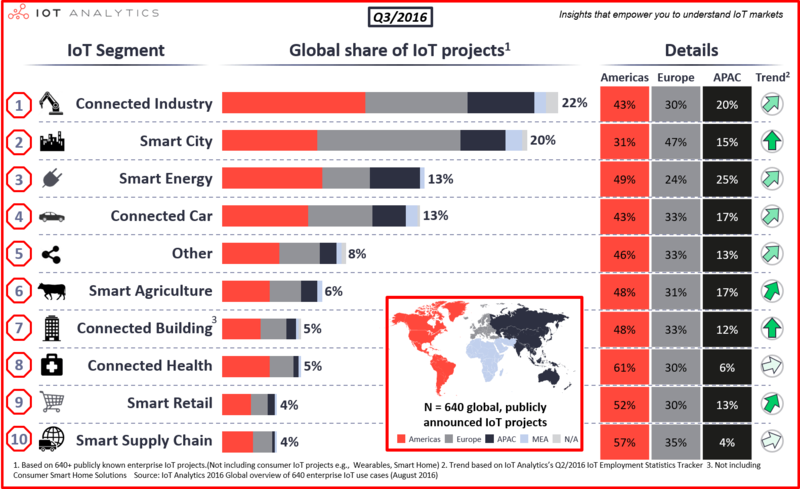 While the list of 640 IoT Projects is certainly not complete, our analysis leads us to conclude that the total number of globally announced and published IoT projects is limited. Triangulating the list with a number of other data points, we believe the total number of IoT enterprise projects (including all unannounced projects) is in the range 7,000 – 10,000 projects. This number is well in line with our overall market model and our observation that expectations for the Internet of Things are overhyped. Our IoT Employment Statistics Tracker confirms strong momentum for IoT initiatives but the starting point is probably lower than most people expect. During a period of 3 months, we spent hundreds of hours researching the IoT projects and verifying them. In a first step, we mined the websites of all major IoT vendors in regards to documented IoT use cases (for the names or the major IoT players compare our company ranking and the list of 360+ IoT Platforms). Furthermore, we carried out a comprehensive and systematic key word search in order to eliminate potential biases and add to the existing repository. Scope: We focused on enterprise IoT solutions that are either directly employed by enterprises or sold to enterprises, thus excluding consumer-only cases such as wearables or home automation). We are huge fans of the Rhino ankle collar, protecting this endangered species.